Reducing the top tax rate for corporations (C Corps) to 20 percent. Reducing the tax rate for S Corporations, LLCs and sole proprietorships to 25 percent. Full repeal of the estate tax and generational skipping transfer tax. Full expensing (or write off) for new investments in depreciable assets for a period of 5 years. Full repeal of the Section 199 deduction. Retaining the research and development credit. While generally applauded by the business community, the proposal is short on details. Obviously, an area of critical importance to PFI members is how domestic renewable energy will be treated, specifically thermal energy. The proposal is silent on that front, but does make reference to "modernizing" the tax regimes that exist for specific industries. Reading between the lines, this could mean removing existing incentives on anything ranging from fossil and renewable energy production to existing incentives for private timberland owners that receive capital gains treatment on their standing timber. We will know more information in the coming days and weeks. In terms of timing, Congress will have to pass a budget in order for this process to move forward. Why? Republican leadership is counting on the budget reconciliation process to pas tax reform through the Senate. Under budget reconciliation, only 51 votes are required for passage, instead the 60 votes necessary under regular order. With Republicans holding 52 seats in the Senate, recruiting enough Democrat votes was estimated by Senate leaders to be a bridge too far. Once the budget hurdle is crossed, the House Ways & Means and Senate Finance Committees will start building out this unified plan with specifics. PFI will be part of this process advocating for our biomass thermal energy tax incentives specifically and a level playing field in the new tax code with other fuel sources generally. Farm Bill: On Thursday, the Senate Agriculture, Nutrition and Forestry Committee held a hearing titledRural Development and Energy Programs: Perspectives for the 2018 Farm Bill. The Rural Energy for America Program (REAP) and some of the other higher profile bioenergy programs in the Farm Bill energy title were profiled. The conclusion of this hearing marks the point for staff on both agriculture committees to begin actually writing the next Farm Bill, which expires in 2018. The proposal that PFI is promoting as part of the Forests in the Farm Bill Coalition would improve and expand upon the Community Wood Energy Program and seed it with robust, mandatory funding for 5 years. The latest version of our proposal would provide grants for wood heat and heat and power projects, as well as grants for building "innovative wood product facilities." This latter addition was made to make the proposal more "sellable" on Capitol Hill, where Committee members are looking to bolster manufacturing jobs and the new concept of "tall wood buildings" using cross laminated timber has attracted policymakers' attention. The Senate this week introduced companion legislation to the New Source Performance Standard relief bill that was introduced in the House-H.R. 453. The Senate bill-S. 1857-would delay Step 2 of the NSPS for 3 years until May 2023. The following is the press release that was distributed. Visit Sen. Capito's website to view the full release. WASHINGTON, D.C. - U.S. Senators Shelley Moore Capito (R-W.Va.), Claire McCaskill (D-Mo. ), Richard Shelby (R-Ala.) and Joe Manchin (D-W.Va.) today introduced legislation to provide regulatory relief to wood and pellet heater manufacturers by delaying implementation of new Environmental Protection Agency (EPA) performance standards. The bipartisan bill extends the effective date of the standards by three years, allowing manufactures the time they need to comply. "West Virginia has one of the highest levels of wood heat users per capita, especially in our rural communities, and our state is home to a number of small businesses affected by these rules," Senator Capito said. "By delaying implementation of EPA's burdensome and unrealistic standards, this bipartisan legislation will give manufacturers a more realistic compliance deadline and ensure West Virginians continue to have access to this affordable and effective source of energy. As chairman of the Environment and Public Works subcommittee with jurisdiction over this issue, I will continue working to advance this legislation in the Senate, providing the regulatory relief our manufacturers need and the clean air energy solutions West Virginians deserve." "Forcing small manufacturers-who sell these stoves to folks in rural Missouri who rely on them to heat their homes and businesses-to comply with unrealistic timelines for these rules makes no sense. Instead we should be giving these businesses a realistic timeline to develop and manufacture stoves and heaters that meet the new emissions standards," Senator McCaskill said. "This legislation is a common sense measure that will provide manufacturers and small businesses, several of which are located in Alabama, the time needed to meet and comply with the new EPA standards. Alabama and other rural states traditionally have more users of wood or pellet stoves as an energy source and are disproportionately impacted by this rule in its current form. It is my hope that Congress will expeditiously consider and pass this bipartisan proposal," Senator Shelby said. "I have always and will always protect our West Virginia small businesses from overreaching and overbearing regulations," Senator Manchin said. "Many West Virginians, especially in our rural communities, use wood stoves in their homes or businesses. This legislation will make sure that our small businesses that manufacture wood heaters and stoves can comply with emission requirements in a way that helps avoid undue economic burden. This bipartisan bill strikes a balance between the environment and the economy and is a step in the right direction as we continue to work toward an all-of-the-above energy policy." "Many of our customers are young to middle-aged families still in the workforce trying to make ends meet by lowering their heating costs by using a wood or pellet stove," said Matt Speakman, owner of Mountain State Fireplace Gallery in Fairmont, West Virginia. "This legislation will help our industry to develop efficient and affordable stoves that customers will want to purchase as well as help us to avoid having stranded product inventory in May 2020. By extending the effective date to May 2023, we will have more time to work on developing new stoves to meet the new EPA standards." 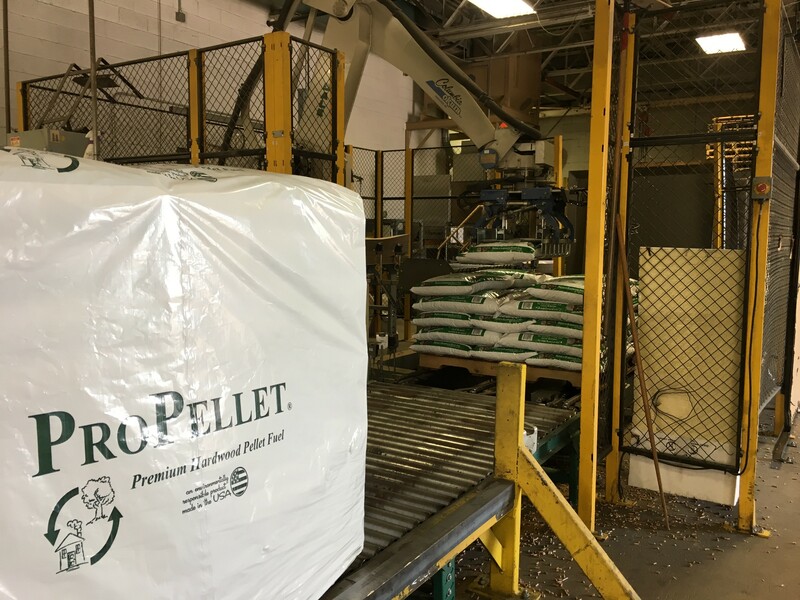 Thanks to Cory Schrock of Fiber By-Products for sending us photos of Fiber By-Products' pellet production! Thank you to all who have registered to host an event for Bioenergy Day 2017! Wednesday, October 18, marks the day for the Fifth Annual Bioenergy Day. Consider inviting an elected official to tour your facility on Bioenergy Day. If you haven't yet signed up, consider inviting an elected official to tour your facility on Bioenergy Day. Whether it's your town's mayor, a state official, a member of Congress, Senator or Governor, Bioenergy Day is the perfect opportunity to introduce government officials to the pellet industry and its many environmental and economic benefits. Contact Carrie Annand with any questions on Bioenergy Day 2017 or to register your organization's event. If you are interested in hosting and elected official, Carrie can also help identify and invite one near you. As Premium Motorsports heads to New Hampshire Motor Speedway for the Monster Energy NASCAR Cup Series, "ISM Connect 300", they will bring returning sponsor, Energex Wood Pellets, who will feature their newest product 'Ol' Hick Cooking Pellets' on Reed Sorenson's #15 Chevrolet SS Cup car. Founded in 1993, Energex Wood Pellets is one of the nation's oldest and largest residential wood pellet producers in North America. 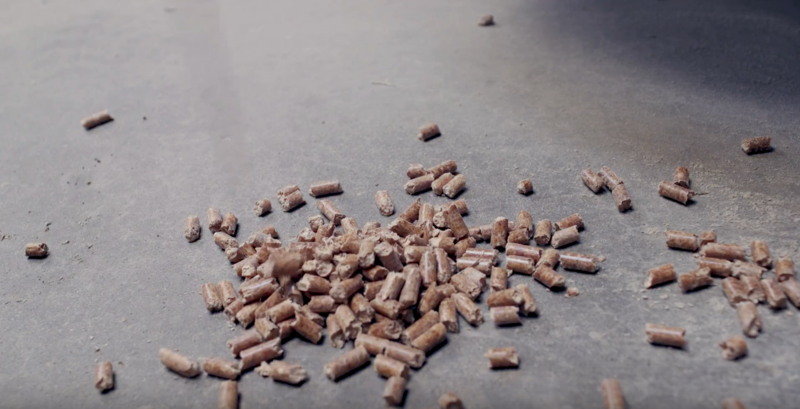 "With plants in both the United States and Canada, Energex has supplied more wood pellet fuel to homes in the Northeastern United States than any other company on the market. We are proud to be a part of the NASCAR family." Last time we saw Energex Wood Pellets on the car was at Pocono Raceway in June. This time Energex brings their newest product, "Ol' Hick Cooking Pellets". What makes Ol' Hick so special is that unlike many of the cooking pellets on today's market, Ol' Hick is made from 100% Appalachian Hickory! It is not blended with any other woods and does not feature any artificial flavorings or additives. Southeast Alaska is a remote island chain, located about 1,100 kilometres north of Seattle, Wash. Most of the region's goods are imported by barge, creating logistical and economic challenges not faced by many other parts of the U.S. This also applies for many types of wood products. Although the region is heavily forested (including the 17 million acre Tongass National Forest), there are no commercial wood pellet mills capable of supplying the region's needs. Thus, pellets for residential heating must be imported, often from Washington or Oregon. Given the long shipping distances, and the need for fossil fuels to power barges, the net environmental benefits are uncertain, and worthy of further analysis. It is within this context that we used life cycle assessment to evaluate the environmental impacts on global warming potential associated with converting home heating systems from heating oil to wood pellets in southeast Alaska. Limited industrial development makes it necessary to import almost all goods into southeast Alaska, primarily by barge. Accounting for carbon associated with heating oil, for example, must include the carbon chemically bound to the product, as well as the carbon resulting from the energy to move the raw product from the north slope of Alaska to Seattle where it is refined and the transportation back to southeast Alaska where it is consumed. Accounting for these energy flows is an important part of comparing alternatives in life cycle analysis. David Brooks's column headlined "My 'burn wood for power' argument goes up in flames" (Monitor front page, Sept. 26) offers an incomplete picture of how timber markets (in this case biomass) benefit New Hampshire's forests and our environment. If you love our forests, if you want less development crowding out our beautiful hardwoods and softwoods, if you prefer healthier and more habitat for New Hampshire's wildlife, then biomass energy and the logging and sawmill industries that support biomass have earned your, and Brooks's, applause. While we continue to grow more trees than we cut (this has been true for many years), approximately two-thirds of the wood our forests produce is classified as low-grade. That is, it isn't good enough to be sawn into lumber or used for veneer or made into wood flooring. The best use of it is to convert it into paper or energy, either as firewood or as woodchips for fuel for biomass energy plants. Canada's forestry and agriculture offer an abundant source of biomass supporting our nation to become a global leader in the burgeoning bioeconomy. This biomass can be transformed into a myriad of useful products such as biomaterials, biochemicals, biofuels, renewable natural gas, and bioenergy that can provide alternatives to the traditional petrochemical products.